Asher "Pete" and Sheila Koch are lifelong residents of Harrison County. Pete, along with his four brothers, John, Bob, Davie and Rick, grew up in Freeport where their parents David and Sarah Farrell Koch owned and operated Koch Funeral Home.The funeral home remains in the family and is now run by his brother and sister-in-law John and Donna Koch. Sheila, her brother Jeff and sister Amanda, grew up in Piedmont. Their parents are Lana Wright Tarbert, who worked at the Freeport Press, and the late Larry Tarbert, who was an excavator for local coal companies but his passion was working on the family farm. 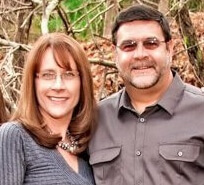 Pete and Sheila are both Lakeland High School graduates who married October 10, 1987 and moved to Scio in 1989. They are extremely proud of our three beautiful daughters Alanna, Ashley and Erica. With an outpouring of community support, they were able to open Koch Funeral Home in Scio in August of 1995. They are members of the Scio United Methodist Church, Scio Civic Club, Jewett Wildcat Center and Scio Fall Festival Committee. Pete is also a member of the Scio VFD, Sons of Scio American Legion Post #482, Scio Masonic Lodge #587 and the Dining Fork Ruritan's. In 2014 they were awarded Outstanding Citizen's of the Year by the Dining Fork Ruritan's.